In 1961, John F. Kennedy made the audacious goal to land a man on the moon and have them return safely by the end of the decade. NASA analysts put those chances at 1 in 10 of actually happening. Neil Armstrong and his fellow astronauts on the Apollo 11 mission would never have achieved that goal in 1969 had it not been for the crew on Apollo 8 who were the first people to ever orbit the moon around Christmas in 1968. Armstrong’s famous first steps on the moon have overshadowed the first lunar orbit but in many ways, this earlier mission was far more impressive and risky. Not only had it never been done before, but NASA was racing against the Russians to get there first, had little time to fully test all of the systems, and had no idea if their plans and calculations would actually hold up if the spaceship actually got there. Not only did their plans work — they were unbelievably accurate throughout the entire mission. Apollo 8 was built using 5.6 million parts and 1.5 million systems, subsystems and assemblies. Assuming a 99.9% effective rate, that would mean they could expect to see 5,600 defects along the way. Charles Lindbergh calculated that Apollo 8 would burn more fuel in the first second of flight than he did on his entire trip on the first-ever nonstop flight across the Atlantic from New York to Paris. The amount of fuel at the outset of the mission had the explosive potential of a small nuclear bomb. At takeoff alone, there was enough energy to power the UK at peak usage time. To achieve orbit outside of the gravitational pull of Earth, Apollo 8 would need to be traveling more than 17,000 miles per hour. On re-entry into the Earth’s atmosphere, they would be traveling almost 25,000 mph. To fly around the other side of the moon, a place no person’s eyes had ever seen before, required 240,000 miles of travel. The moon itself would move 150,000 miles (more than 2,000 mph) in the time it took for the spacecraft to get there. They flew within just 69 miles of the moon’s surface but had no idea if their radars would be effective at such a close distance from so far away. 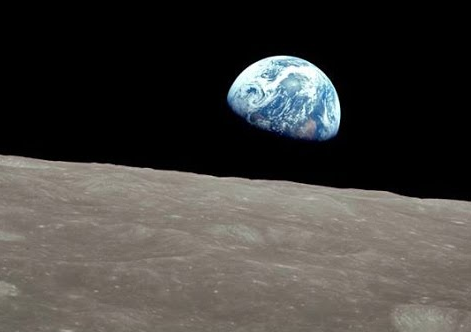 The biggest test would come when Apollo 8 would reach the far side of the moon. At that point, the ship would lose radio contact. Frank Borman, the Commander of the flight, was fixated on this moment in the months leading up to takeoff. They calculated the orientation of the spaceship in the flight plan by aligning themselves with the stars through what’s called sextant sightings. This was similar to the system sailing ships have used for centuries by measuring the angles between the sun, the moon, and the stars. NASA specialists who planned the flight would calculate the ship’s altitude based on its position relative to different stars and use the thrusters to keep its position in the desired location. Any calculated change in velocity would let the crew and mission control know if they were on course or had made a grievous error. If radio contact was lost for too long, it meant the ship was traveling too fast and was off course. If they lost radio contact too early it meant orbit was off. If either of these scenarios came to pass the astronauts would likely be lost in space forever as they wouldn’t have the fuel required to fight the gravitational pull of the moon to make it home. Lovell and Anders stared at the clock. The view out the windows became even darker. The astronauts’ headsets went silent. Borman looked at the clock. Anders had seen how concerned—obsessed—Borman had been about this moment during training. It took a second for Borman to realize Anders was kidding. After that, Borman couldn’t stop smiling. Another critical hurdle in the Apollo 8 mission had been cleared. In Houston, controllers looked at each other with a sense of wonder and relief, shaking their heads and then shaking hands. Orbital mechanics—the way the universe ordered and moved itself—worked. And man had figured it out to the split second. When the ship finished its first orbit of the far side of the moon they also came back into radio contact within one second of NASA’s estimate. They had calculated the dimensions of the orbit of the moon to within a fraction of a mile. The level of precision and detail that went into this flight plan was amazingly accurate. Some fields allow practitioners the ability to work with an extreme level of precision, even in the face of uncertainty. Finance is not one of those fields. You can’t calculate relationships in the markets like you can the distance between the stars. Retirement planning, portfolio management, investing strategies and personal finance are all forms of guesswork in many ways. You’re forced to deal with uncertainty but you don’t have a perfect model which allows you to calculate your exact position in relation to your goal. Planning out your financial future is like trying to calculate orbital mechanics while all of the stars are constantly moving and changing shape. Just like the astronauts, you have to make occasional course corrections. But unlike the heroes who went to the moon and back, you can’t tell if those course corrections are helping or hurting right away. On Christmas day during that Apollo 8 mission, some of the crew had their families at NASA headquarters in Houston. Someone in the control room had his 5-year-old son with him. The boy asked astronaut Bill Anders who was driving the ship. Finance requires us to be comfortable with inexact calculations, relationships, and human emotions. You must be willing to accept good enough in place of perfect to survive.